Mühlendorf is about 2 km from Stegaurach, where there are several supermarkets, bakers, butchers, banks, doctors, hairdressers, pharmacies, petrol station, pizzeria and small snacks. The equipment: Your bed is 180x200 cm wide. On request, we can also provide a baby bed! Bed linen and towels are included. A coffee machine, water cooker, toaster, microwave, ceran hob, refrigerator, dishwasher, dining table and bathroom with toilet, shower and hairdryer make the accommodation perfect. 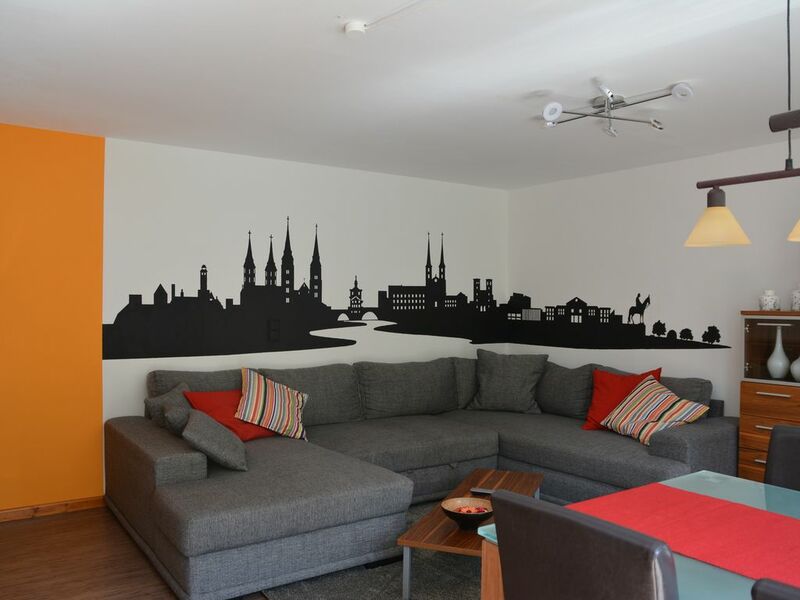 In the spacious living room with the large flat screen TV you can take off the XXL-Wohnlandschaft to a large and comfortable sleeping (160x300cm). All rooms have heating. Since the apartment is an apartment, the floor is a bit cool, so we recommend to bring slippers or the like. In the summer it is wonderfully cool, so you do not get sweat. Mühlendorf is located on the small Aurach in the beautiful Aurach Valley and at the gateway to the Steigerwald and is not far from the Franconian Switzerland, which invites you with its caves and rocks to many beautiful day trips! It belongs to the municipality of Stegaurach in the district of Bamberg. To Bamberg it is about 8 minutes by car. A well-developed cycling and hiking trail network is ideal for excursions in the surrounding area! For a refreshment or a snack, you can walk to the local brewery restaurant with beer cellar, which is about 4 minutes away. Let yourself be pampered by the Franconian specialties and a cool, often still self-brewed beer. A beautifully appointed appartment in the countryside near the attractive city of Bamberg. We hardly had a moment's rest. We visited historic Bamberg, played golf on a lovely nine hole course and found some peaceful lakes to picnic and read by. Its location also gave us the opportunity to take the train / bus to Prague - a wonderful experience. A holiday totally to be recommended. Amazing. We found it by accident but it would be our only choice for future trips to the region! Thanks so much for a great experience!!!!! Die Wohnung befindet sich im Untergeschoss des Vermieters. Schönes, helles Wohnzimmer mit grosser Couch. Ruhige Lage, super Ausgangspunkt für Ausflüge. Bamberg ist eine wirklich schöne Stadt. Wir haben die Wohnung wie beschrieben vorgefunden, alles sauber und ein netter Empfang! Über die Umgebung wurde schon genug geschrieben,da können wir uns nur anschließen und die Wohnung weiter empfehlen. Vielen Dank für eure lieben Worte zu unserer Ferienwohnung! Ruhige doch zentral nach Bamberg gelegene Ferienwohnung. Sehr schöne und saubere Ferienwohnung mit allem ausgestattet was man benötigt. Herzlichen Dank dafür, dass ihr unsere Fewo soooo pikobello hinterlassen habt! Die Wohnung war sauber und in einem sehr gutem Zustand. Die Küche war mit allem möglichem ausgestattet, von Geräten, Gewürzen und Kleinkram. Perfekt, wenn man für einen Kurzurlaub nicht alles mitschleppen, bzw. kaufen will. Die Lage ist ruhig, Bamberg ist schnell zu erreichen und der nächste Gasthof 5min zu Fuss.